Last week I talked about how the “death” of Tria in University City gave birth to The Fat Ham. In the same vein, another of my previously reviewed spots that has since closed, Bisou Bistro, has given birth to this week’s burger at Beast & Ale in Manayunk. Beast & Ale is operated by the same wonderful crew that owns the Feliz trio of restaurants (Cantina Feliz in Fort Washington (Montgomery County), La Calaca Feliz in Philadelphia’s Fairmount neighborhood, & Taqueria Feliz, also in Manayunk). Venturing away from the Mexican food realm, Beast & Ale serves up more pub-style, “greasy spoon” fare including a double decker “Beast Burger”: two quarter-pound patties topped with dijonnaise, American cheese, red onion, lettuce and pickles underneath a brioche bun. If you’re not feeling so beastly, you can get a single patty “Baby Beast” version of the burger, and there’s even a special section of “fixin’s” you can add on for an additional charge. While the burger comes paired with a mixed greens salad, you can substitute fries for $1 – and let’s face it, you’ll want to substitute fries! I ordered the basic version of the Beast Burger. I wasn’t asked how I wanted my burger cooked, but that was to be expected since the patties are pretty thin. They came out cooked at around medium, and were still nice and juicy considering their size. The bun was a little bit too large for the width of the individual patties, but considering they were double stacked, I only found myself with one or two bun-only bites at the end. And with all the gooey cheese on each patty and meat juices, the bun certainly stood up to the challenge. I didn’t start to notice the dijonaisse flavor until my last few bites of the burger, but it didn’t really add or take away from the overall flavor of the burger itself. 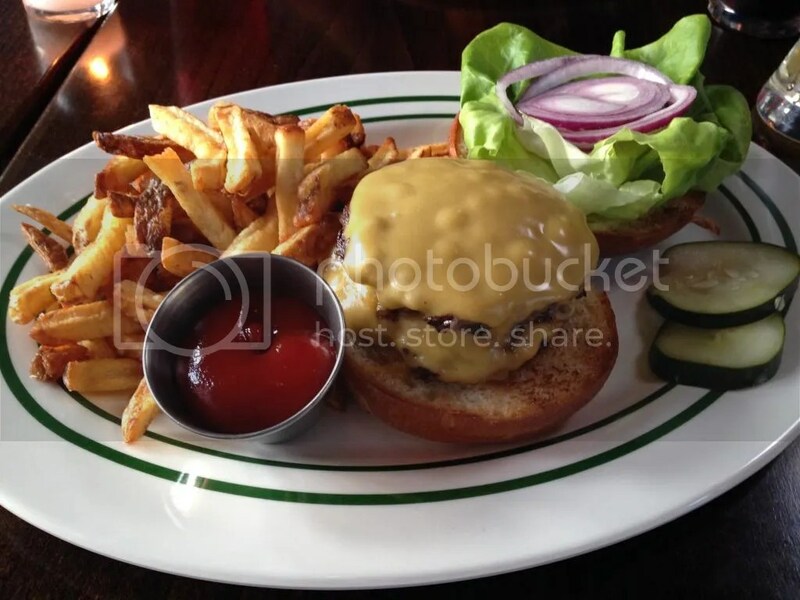 This burger was definitely a tastier treat then the spot’s predecessor and a fine addition to Main Street Manayunk. Posted in American cheese, Beast & Ale, Beast Burger, brioche, buns, burger, burgers, double stacked, Feliz, Manayunk. Bookmark the permalink.